We are all looking for ways to ensure a longer, happier life and according to many doctors, dieticians, and nutritionists eating fish may be one of the best steps you can take for your heart health. If you're worried about heart disease � whether you want to avoid it, or you already have it and want to get healthier � eating one to two servings of fish a week could reduce your risk of dying of a heart attack by a third or more. Those may sound like big numbers to throw around, but research shows that adding more fish to your diet can have huge returns. Health professionals have long recognized that the unsaturated fats in fish, called omega-3 fatty acids, appear to reduce your risk of dying of heart disease. For many years, the American Heart Association has recommended that people eat fish rich in omega-3 fatty acids at least twice a week. Some people still have concerns about mercury or other contaminants that may be found in fish, but when it comes to a healthier heart, the benefits of eating fish usually outweigh the possible risks of exposure to contaminants. The following information from the American Heart Association give some good guidelines for those who may be most concerned. �The benefits and risks of eating fish vary depending on a person�s stage of life. 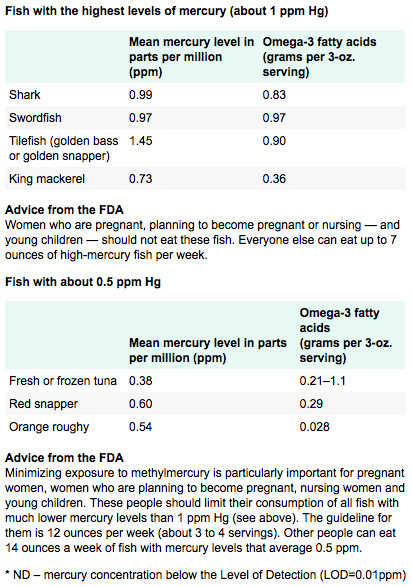 Also use these charts as a guide for which fish are the best choices for you and your family. By substituting fish high in unsaturated fatty acids for foods with saturated fatty acids, such as meat, you may lower your cholesterol considerably. But the main beneficial nutrient appears to be omega-3 fatty acids in fatty fish. Omega-3 fatty acids are a type of unsaturated fatty acid that's thought to reduce inflammation throughout the body. The health benefits don�t end there. Omega-3 fatty acids are also believed to improve learning ability in children, decrease triglycerides, lower blood pressure, reduce blood clotting, enhance immune function and improve arthritis symptoms. Consuming one to two servings a week of fish, particularly fish that's rich in omega-3 fatty acids, appears to reduce the risk of heart disease, particularly sudden cardiac death. What kind of fish should you eat? Fatty fish, such as salmon, herring, and to a lesser extent tuna, contain the most omega-3 fatty acids and therefore the most benefit, but many types of seafood contain small amounts of omega-3 fatty acids. Most freshwater fish have less omega-3 fatty acids than do fatty fish from the sea. 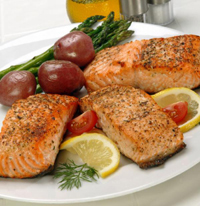 Some varieties of trout have relatively high levels of omega-3 fatty acids. 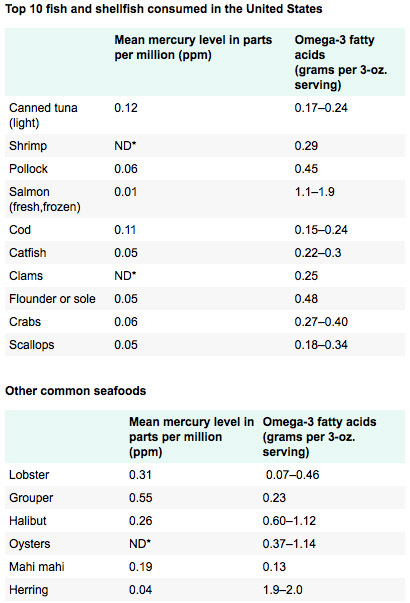 The list above will help you determine the amount of Omega-3 fatty acid you may find in a fish. Are there any types of fish you should avoid? Some fish, such as tilapia and catfish, have low levels of omega-3 fatty acids and high levels of arachidonic acid, a type of omega-6 fatty acid that's also found in red meat and egg yolks. Eating too much arachidonic acid can increase your risk of heart disease because it can cause inflammation, which can contribute to the buildup of plaques in your arteries. This can cause coronary artery disease, a heart attack or stroke.